Will U.S. Citizens And U.S. Politicians Recognize The USA Highway Holocaust That Occurs Each Year And Do Something About It? (San Diego, California, USA): Did you know? 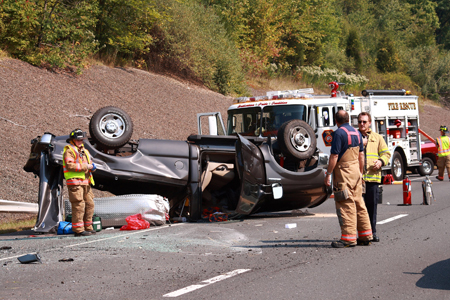 Since 1950, in the United States alone, more than 32,000 people have died each year, due to road vehicle accidents. From 1966 to 1973 over 50,000 people per year, died on U.S. roads! These horrific, tragic and staggering road vehicle death-tolls, apparently, are joyfully ignored by the media, almost all U.S. citizens and by our politicians. The records of "motor vehicle fatality rates" in the USA date as far back as 1899. * For 113 years (from 1899 to 2012), over 3.5 million people have died on the roads in the United States of America. * This is why I call it the USA Highway Holocaust. As far as I know, no one is talking about it. Not the media, not politicians and certainly, not the general public. There is simply no excuse for this disgusting annual death-toll. Yet, when airplane and helicopter crashes occur, the general public, the media and politicians sound very loud warning cries of desperation to ensure there will be better safety measures and controls for aviation in the future. * There is certainly something very wrong with our priorities here in the USA. Be that as it may, compare 17 fatal helicopter accidents to 35,485 people who died in horrific motor vehicle accidents in the USA in 2015. 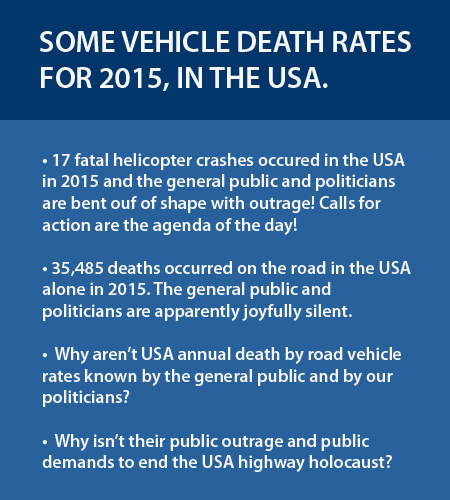 Are deaths by road-vehicle simply not as important as death by aviation accidents? Doesn't it make you wonder why people get bent out of shape when there are deaths by airplanes and helicopters but not by land-based vechicle deaths? While the entire aviation industry's goal is to have 100% safe flights, the really big questions is this: Why doesn't the U.S. government have the same goal of 100% safe travel by road vehicles? Where are the community activist meetings demanding that politicians stop these needless motor vehicle deaths? What will it take to get politicians and the general public to demand we apply the same strict rules of aviation safety, to road vehicles? About 17 years ago, I was a part-time unpaid Equal Rights activist. (Looking back, I almost regret putting in so much unpaid labor time when I really needed to get paid!) However, one of the few things I took away with me was when a woman activist friend of mine who said to me, "It all boils down to education." She said, "Racism, sexism, Equal Rights, Transgender people, etc., can be understood by almost anyone, through education." To me the answer to safety on the road is education. That is, we need much better drivers training, for all drivers. Non-profit helicopter organizations promote 100% safe helicopter flights, many helicopter operators have company directives for 100% safe flights and achieve this, and even helicopter pilots write articles urging all helicopter pilots to have the goal of 100% safe flights and to never initiate a risky flight due to being fearful of reducing company profits. So why isn't the U.S. government using the same play book used by the helicopter industry towards safety on the roads? The answer is this, we could but we don't. At least at this point in time. What we need is to educate our entire nation that safety for individuals on the road is just as critical and as important as safety is for people in the air. When we look at aviation, we see that pilots are retrained each year to make sure they are proficient at their job. It's called recurrent training. This is why aviation has some of the best safety records for moving vehicles in the world. In fact, training (or education) is so important in aviation, that there is a multi-billion dollar industry in the making and selling of high-tech aviation simulators. 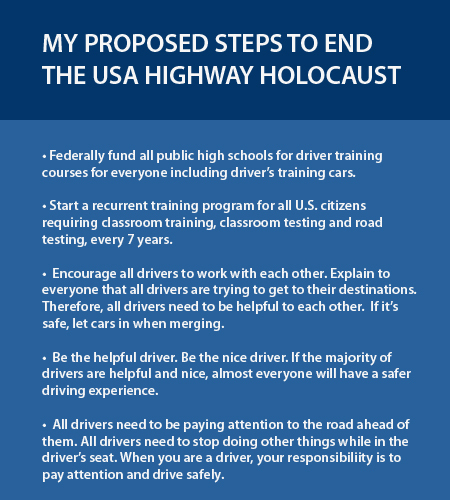 Here are my recommendations to greatly reducing the number of deaths by road vehicles in the USA. 1. Bring Back Government Funded High School Driver's Training. I'd bring back driving training in all high schools and have it federally funded. That way all high schools will have the money to train teenagers whether their tax base is large or small. This funding should be used for the driver training instructors, classes and cars. When I was a teenager, I still remember to this day, taking a driver's training course. When I was driving for the first time down a road, my instructor wanted me to quickly turn right, onto a side street. I was too nervous and I didn't feel there was enough room to break and make the turn safely. He grabbed his instructor's steering wheel which automatically disengaged all my car controls and he used the breaks to quickly slow the car down and then he turned right. "I couldn't believe this could be done! ", I thought. I really learned from this experience. I realized that you could apply the breaks and take control of the car! Drivers training cars are a key component for training people to be good drivers. 2. Mandatory Recurrent Training For All Drivers. 3. All Drivers Need To Recognize That All Other Drivers Are Trying To Get To Their Destinations Just As You Are Doing. We need a new mind set for all American drivers. Instead of working against each other while driving, all drivers need to realize that everyone is trying to get to their destination which is why everyone driving should be working together to help each other. What a concept! Driver instructors need to teach everyone to be the helpful driver. To help others merge on roads safely, to help each other pass safely, and to take turns at intersections with stop signs and to be very careful allowing people to walk across sidewalks. 4. We need to address the pseudo-urgency that many drivers have. For those drivers who drive extremely fast because they are in a rush to get to their destination, they need to learn that the pseudo-urgency to place yourself and others in danger when driving fast is a very irresponsible way to drive. This type of driving needs to stop. 5. We Need To Address Slow And Bad Drivers. We need to understand that some drivers are very slow drivers. They need to learn that driving too slow can actually be dangerous to other drivers! Should really slow drivers realize their limitations and stop driving altogether? What is the responsible course of action here? This issue needs to be addressed in a fair manner by the government. 6. All Drivers Need To Start Paying Attention And Get Off Their Damn Phones. I'm now seeing many people not driving when the light turns green. Why is this? They are texting on their phones. When driving, all people need to pay attention at traffic lights and be ready when the light turns green. If it is important that have to text, use an app or look something up online, then pull over safely, stop your car and then get out your phone. When a driver is the first person at a traffic light, that driver has the responsibility to watch the light and when the light turns green (as long as no other cars are running a red light), then they need to press that gas pedal and go! 7. Responsibly Get Off The Road When Confused About Where They Are Trying To Go. Drivers who are confused when trying to find their destination need to safely pull over on the side of the road and get their bearings, instead of slowing down or stopping in the middle of the road and holding up traffic or causing accidents. I now regularly see people just stopping their cars in the middle of a street for no reason. They don't put on a turn signal, they are not pulling off the road slightly and no one is entering or exiting the car. They simply stop their car in the middle of the lane. I'll tap my horn and then they drive on normally. Why are people driving to horribly? If a driver needs to stop their car to get their bearings, they need to use their turn signals and pull over safely into a parking space, stop, put the car in park and put on their parking brake. Then get out Google Maps or a printed map and figure out where to drive. I am now seeing more drivers making extremely dangerous and illegal turns trying to save time. I've seen people at large intersections at a stop light, who are in the third lane on the left and they actually make a right turn, drive down the sidewalk and then quickly turn to drive down the road. It's quite horrifying. I've seen other drivers, in the far right lane, quickly make a left turn and cut in front of several lanes of drivers because the drive is try to save time because they made a mistake. When drivers make a mistake, instead of driving illegally to fix their error, they should continue on down the road and make a legal turn to correct their driving error. 8. Use Your Turn Signals. Turn signals are there for a reason. Use them. If you aren't using your turn signals, you are not being a courteous driver. It's the responsibility of the driver to know what is in front of you, on both sides of you and behind you. There is the quick glance method of driving. That means you need to know what is going around you when you drive. To do this, you quickly look in your mirrors for a second and then immediately go back to keeping your eyes on the road in front of you. If the driver is driving and pretends they don't have to be aware who is beside and behind them, then these are the drivers who are most likely, causing problems for other drivers. 10. Pedestrian and Drivers BOTH Need To Be Extremely Careful Around Sidewalks. In California, it used to be that all drivers would stop for people walking across a crosswalk. Today, it seems that many drivers will not stop for pedestrians or will drive fast trying to intimate the pedestrian, so they can get their car through the crosswalk. This is irresponsible driving. All drivers need to stop for pedestrians. From the pedestrians point of view, if you are not looking left and right, and then left and right again (and again) before you cross the street, you are not being a responsible pedestrian. If you are a pedestrian and you simply step out onto the sidewalk and look forward the entire time and you assume all cars will stop for you and you never look left or right, then you are an accident (or death) waiting to happen. And remember, even a good driver can sometimes, not see a pedestrian. This is why pedestrians need to continually look left and right, when crossing sidewalks. If you are capable of walking at a normal pace, but you actually walk slower through cross walks, to spite drivers, you are being an irresponsible pedestrian. However, drivers need to remember there are some people who can't walk fast due to bad knees or they might have had a recent accident and now can't walk at a fast pace. I had a friend of mine who broke his toe recently and he simply could not walk fast due to the pain. He was very upset that cars would intimidate him in crosswalks. It takes two to tango. Pedestrians need to look before they walk and continue to look both ways while walking on a crosswalk and drivers need to stop for pedestrians in crosswalks. Pedestrians and drivers BOTH need to work together. Just because a person is driving an $80,000.00 USD or $120,000.00 USD car, doesn't give them the license to be break any traffic law they want and does not give them the right to be mean to others when driving. All drivers need follow all traffic laws and be nice to other drivers and pedestrians. 11. Be Super Responsible Drivers. All drivers need to realize that when they are behind the wheel of a car, they are responsible for all their actions. A driver's responsibility is just like the responsibility of an airplane or helicopter pilot. Drivers need to take driving seriously. Years ago, I remember I was about to take off as a passenger in the copilot's seat of a helicopter on a training flight. The helicopter pilot said to me, we can joke all we want when in the hangar and on the ground but when we get inside the helicopter, that's when the joking stops. It's important for all drivers to concentrate on their job. To drive the damn car safely! Once again, all drivers need to stop holding cell phones in their hands, whether they are talking or texting. This means do not hold the damn phone in your hand when waiting at traffic lights or when driving. Drivers also need to remember not to comb their hair, brush their teeth, put on make-up or do any other distracting activity while driving a car. We as a society need to collectively understand that there is one thing that people want. To have nice lives and take care of themselves and loved ones. How do we know this? There is a little known world Gallup poll taken in 2010. Gallup considers this poll to be one of their very most important polls they've ever conducted. Gallup took an international poll from people of all ages, wages and from 160 countries. The question went something like this, "If you could have one thing, what would it be?" The answer was, "A good job." Because if you have a good job, you can take care of yourself, families, partners, loved ones and friends, and have a good life. * All drivers need to do their part and drive safely so that when we arrive at our destinations we arrive alive, so we can all enjoy our lives. Also, while writing this article, I went online to look up driver tips. I was surprised at all the things I did not know which will make me a better driver. And remember, not only look at websites but be sure the look up driving tip videos on YouTube. Some of the videos also include great tips on cleaning the car, better ways to store things in a car and more. For people to have nice lives, we have to ensure that proper education, training and good products are made for all drivers, to keep everyone as safe as possible on our roads, so that everyone can enjoy their entire life without dying before their time. For those business owners, CEOs and marketing communications employees in the helicopter industry, if you have any questions for us, please feel free to give us a call +1 (858) 413-7074 or email us at staff@helicopterlinks.com and let's discuss how Helicopter Links can help you advertise to buyers in the buying process. "If It Bleeds, It Leads: Understanding Fear-Based Media"
"What the Whole World Wants"